Our coaching of Cricket builds, self confidence, ball skills, working as a team, self reliance, and promotes fun in sport. We have two Junior Development groups practicing cricket on Saturday Mornings. The MCA also volunteer with Inspire, a local inclusion charity and are also attending regular coaching sessions at local schools. 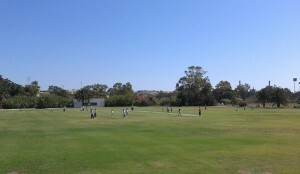 Cricket is played every Saturday. Whether you are a junior (from 8 years, boy or girl) or a player of any standard, this is what you can do to get involved. Introduce yourself any Saturday at the Marsa Sports Club, when a game should be taking place. You can also then become a member of the Marsa Sports Club and enjoy it’s many other facilities. “The Marsa” Oval with children practicing the game of Cricket.